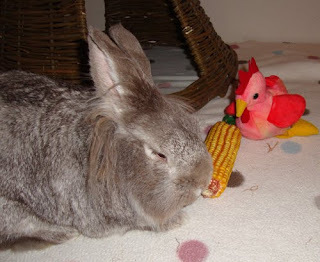 ...and Humphrey even offered Ernest a nibble of his corn on the cob. 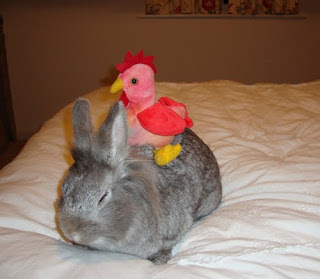 Now THAT'S bunny friendship. They're supposed to have settled down for the night now but I'm sure I can hear shenanigans upstairs. Not sure yet what we'll be up to tomorrow. I'm off to the hairdressers in the morning and am tempted to take Ernest with me, but I've not been there before and there's the outside possibility that they might think I'm a bit mad if I turn up with a rooster...? If you take Ernest, you have to take Humphrey too! They look so sweet together. Humphrey is a doll. I think Ernest would love Denver. I'd show him the sights. Promise. They look to be enjoying each others company! Humphrey has a wonderful hairstyle! Oh Charlotte - you have made my day with your photos of Humphrey & Ernest - yes perhaps the hairdressers is a little too adventurous a trip ! 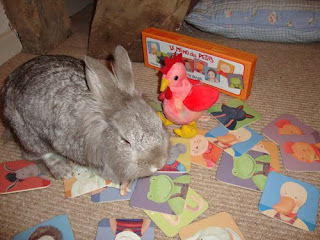 We would love Ernest to come and stay with us for a bit, especially as he gets on so well with bunnies. 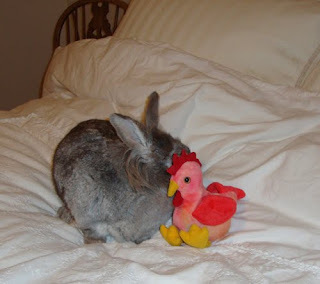 Awwww soo cute, i love Humphrey, he's just the sweetest bunny. Ernest is very welcome to stay at our little cottage - we are roosterless at the moment! But lots of lovely girls for him to be introduced to! Good friends they are indeed! Precious! I could kiss Humphrey all day! He is so darn adorable!